They were gutsy. They were spirited. They were the nurses of Hopkins Hospital units 18 and 118. Together they soothed and saved thousands of Allied men, and expanded the role of military women for decades to come. DECEMBER 1944--Hopkins nurse Ruth Dale was on red alert in Hollandia, New Guinea. Weeks earlier, a contingent of Hopkins doctors from the 118th General Hospital had gone ahead to the Philippines to set up a new surgical unit. Dale and the rest of the 60 or so Hopkins nurses were awaiting orders from the U.S. Army. Word came on Christmas Eve. Dale was playing the organ at midnight Mass, dressed in her tan uniform--a safari jacket and slacks--and laced-up Army boots. A canteen, gas mask, and canvas bag with a toothbrush and a change of underwear lay nearby. Opening photo at top: As officers and nurses in World War II, women worked in the mud and rain to care for wounded soldiers in Leyte, Philippines. As she played, a man in a uniform walked up and tapped her on the shoulder. "I was called up in the middle of a hymn," she remembers. The next stop a few days later would be Leyte, Philippines--the last major assignment for the Hopkins doctors and nurses of unit 118 who volunteered to serve together for more than three years in World War II. Another Hopkins general hospital, No. 18, was sent to Fiji and then on to India to treat soldiers wounded in the Pacific theater. Uncle Sam had recruited Johns Hopkins to create the university-affiliated hospital units to serve during wartime. First launched in World War I and called up again--for the final time--in World War II, such units were part of a unique program that allowed medical personnel to join the military as part of a cohesive team. The University of Maryland, Harvard University, the University of Pennsylvania, and other medical schools also sent doctors and nurses to serve abroad. "The Army needed trained people, and here you are getting an established hospital," says Stephen Everett, historian with the Army's Organizational History Branch. "These people had worked together before and were familiar with each other's techniques." The university-affiliated hospitals offered dramatic opportunities for some of Hopkins' most well-known doctors, including John M.T. Finney, who gave up his surgical practice in Baltimore to go to the front in World War I as an Army major and the hospital unit's chief surgeon. He was promoted to brigadier general. And, in WWII, Major R. Carmichael Tilghman (A&S '25, Med '32) recorded the 18th General Hospital's history in the South Pacific and Burma-India theaters and was one of the last Hopkins officers to return home, as a lieutenant colonel. With the university's reputation preceding them, these doctors created Hopkins-quality operating rooms under rain-soggy canvas tents; conducted scientific studies on the long-term effects of malaria and other diseases; and helped lead hospital staff through air raids, gunfire, and stretches of stultifying inactivity between the waves of wounded. These units also served another historic function: They created new opportunities for women to serve in wartime as nurses and, by World War II, as officers, expanding the role of military women for decades to come. Hopkins nurses fought for equal pay for equal rank. Accustomed to autonomy in the operating room and support from Hopkins doctors, they took on roles that had long been off-limits to women. Now, they're being recognized. The Women In Military Service For America Memorial (WIMSA), which also functions as a museum chronicling military milestones, was dedicated last year at Arlington National Cemetery in Virginia. Directors there are pushing to enroll female veterans in a database, where name, rank, honors, and personal stories are accessible via computer screens set flush in wood-paneled walls. Hopkins nurses and alumni also are reaching out, posting notes in this magazine and other publications. "We want to have literally every woman who served to be registered," says Judith Bellafaire, a WIMSA curator. "At least 1.2 million women served in or with the military since the American Revolution, yet we only have something like 300,000 women registered. With the names will come the stories and photographs and whatever knowledge we can get out of this. It's sort of uncovering the hidden history." Personal stories make vivid that undiscovered history. Take Hopkins nurse Bessie Baker ('02), whose name is not yet found in the database, curators say. If she were listed, visitors could tap a few keys and find out that Baker, chief of 64 nurses at Hopkins Base Hospital No. 18 in World War I, called Baltimore home. They could learn about one night in spring 1918, when American Expeditionary Forces were holding a portion of the Western Front in France, and 250 men stumbled into the Hopkins base hospital, blinded by gas, their faces blistered and burned. As Baker wrote in reports read back home: "As we went around the wards, stepping over the stretchers, bending down to the floor with a hot drink, or with a match to light a cigarette for an armless man, we were almost ready to cry 'quits' at any cost. How savage, how inexpressibly futile has become this light valuation of human life!" Hopkins doctors and nurses of the 18th and 118th General Hospitals gather at the Christ statue before leaving Baltimore on April 20, 1942. Since few nurses from World War I are still living, their experiences are now stored in archives or portrayed in books, such as The History of American Red Cross Nursing, which contains Baker's story. Those nurses who served in the Second World War can provide an oral history today, yet many of these veterans are in their 70s and 80s. Dale ('42), whose married name is Ogilby, is now 79 and living in a retirement community in California. She has passed along her war memorabilia, keeping only a few snapshots of herself holding babies she delivered on the ship home. Hopkins unit nurses used to get together every five years to reminisce, and kept letters, memos, photos, and other material for a book. "Then we thought no one would be interested but us," she says. The women eventually donated the material to the Hopkins medical archives, and apparently never got around to a 30th reunion. Most were dying off, she says: "When we were gone, who would care?" To quilt together a story about Hopkins nurses in World War II, the magazine perused letters, historical summaries, photos, newspaper reports, and eyewitness accounts, and interviewed veterans. Though nurses downplay their roles both at home and abroad, their accomplishments marked a turning point for women in American culture. Historian Tilghman, who is now 94 and living in Baltimore, remembers the nurses he worked alongside in the 18th by name, rank, and accomplishments: "Our nurses were very dignified. The men respected them tremendously. And they were top-flight people--they just sort of commanded that respect." "I know it is hard to cheerfully give up your daughters. Many of you have seen your sons go off in uniform and have thanked your lucky stars that your daughters wouldn't have to follow. But when you watched your daughter get her nurse's cap, you were seeing her take on a responsibility which is as great--perhaps greater--than most men's. She was taking on the responsibility to serve where she was needed most. She is needed on the battlefronts and in camps. --from a five-minute speech for Service and Woman's Clubs, The American Red Cross's nursing enrollment publicity kit #3, 1942. "Uncle Sam Needs Nurses!" read the bold-faced statement on military recruitment pamphlets. It was a declaration heard often by 1941, when Hopkins operating room nurse Mary Patterson ('40) started hearing the buzz about Johns Hopkins pulling together another hospital unit similar to the one sent to France in World War I. "The news was all over the hospital--you know how news can go through a small area like that," she remembers. "We heard they were forming a unit to go overseas and looking for volunteers to go. I wanted to go. My brother and a lot of my friends were in the Army and I wanted to take care of them. "We went over with our friends from Hopkins and knew practically everybody in the unit," Patterson (now Shipley), 81, says, "so that wasn't bad." She and the other Hopkins nurses had heard all the U.S. government radio spots trumpeting "Nursing is a woman's job!" Wartime nurses were recruited and screened by the American Red Cross, and joined the U.S. Army. Women also served in the military as dietitians and radio operators, and in other non-combat jobs, though nursing was still the primary career choice. The desire to join was fierce. One Hopkins nurse, Bernice White ('39), was rejected by the War Department because her left foot was slightly deformed after a bout with polio. In a March 1942 letter to Hopkins administrators, she offered to undergo an operation so she'd qualify. She couldn't get it done in time to join the unit, so, with great regret, she decided to hold off. "It's terribly hard to give up entirely the idea of going with the unit," White wrote. She had little time. The Army activated the Hopkins general hospitals soon after the bombing of Pearl Harbor in December 1941. The next spring, the units were called up. To meet Army requests, the university created two 500-bed hospital units, one named after the World War I Base Hospital No. 18 "for sentimental reasons," the other taking the close numerical moniker, 118, according to Thomas B. Turner, dean emeritus of the medical faculty, whose 1974 Heritage of Excellence chronicles the history of the Johns Hopkins Medical Institutions from 1914 to 1947. On April 20, 1942, the Hopkins hospital units left Baltimore by train, both heading eventually to the South Pacific. Anna D. Wolf ('15), director of the Hopkins School of Nursing, typed up her thoughts on their deployment: "What mingled emotions we had as we bid god-speed to our many friends who were leaving us to join our great national army for victory!" Wolf reported that units 18 and 118 each included about 60 nurses, the majority being alumnae or nurses working at Hopkins. They were specialists in anesthesia, surgery, psychiatric nursing, critical patient care, and administration. Many would become second and first lieutenants in the Army. On her way to Australia on the U.S.S. West Point was Mary Farr. Farr ('41) joined the staff of the 118th partly to work with Mary Sanders, the unit's chief nurse. Sanders ('34) was a strong leader, rising to the rank of lieutenant colonel in the Army, one of the first American women to earn that status. After marrying Army chaplain Harry Price in the Philippines, Sanders would return home to serve as director of the School of Nursing from 1955 to 1970. Sanders, Farr, and other Hopkins nurses worked in the wards and operating rooms the unit set up in Australia and the Philippines. In three years, the staff at the 118th General Hospital would care for more than 40,000 patients. Farr, whose married name is Heeg, is now 85 and living in Maine. After the war, she returned home to eventually teach medical nursing at Hopkins for 18 years. When pressed a bit, she can vividly recall military experiences of a half-century ago. "Some of the wounds were terrible," she says in a phone interview from her home. "The airplanes would come in with casualties in the late afternoon and early evening, and we'd be working all night. It was a busy time. "One morning, I was on duty and there was, I guess he was a Marine, a pilot. His plane blew up on take-off," she remembers. "He was burned somewhat, but the main thing was his right arm was hanging by a little bit of skin. We gave him a huge dose of morphine so we could go ahead and clean him up." Later, back in the States, she would meet him in a chance encounter: "That man was sent home and I ran into him on a train. I was home then, this must have been September or October 1945. "I saw him go by and he had a prosthesis and had a hook on his right hand. He also had a scar on his forehead," she says. "I remember that I had been talking to him as we were working on him in the operating room and looking at that scar. "So, I followed him down to the club car," she remembers. They started talking, and he told her how Major William E. Grose ('39), a Hopkins doctor with the unit, had advised him to keep the skin pulled down on this shoulder to form a stump. "When he was in the hospital later, the doctor told him his Army doctor was right. It made a nice stump to fit the prosthesis. He's the only patient I ever saw again." The 118th General Hospital moved around several times. The unit's doctors and nurses, who landed in Melbourne, Australia, in June 1942, then went on to Sydney. They received their first casualties at the Royal Prince Alfred Hospital, which the Australians offered to share until Hopkins could set up its own. General hospitals served as an end link in the chain of military medical care. Medics treated the wounded on the field. The seriously injured went to field hospitals. General hospital staff treated specialized surgery or contagious disease cases, as well as the wounded who were stabilized and still in need of care. Some of the patients at the Hopkins 118th General were American officers who had escaped Japanese prison camps, and found their way to Australia. They suffered from hunger, exhaustion, and dehydration. Though long hours in operating rooms and on the wards were common, the doctors and nurses also faced extended lulls in Australia. During quiet moments, Hopkins nurses started up a softball team, played bridge, or took Red Cross-sponsored dance classes. There were tours of Parliament and local hospitals. Two dozen nurses owned bicycles, and four, including Farr, owned horses. Enthralled with the South Pacific, the Americans enjoyed beach parties and bus trips to sightseeing locales. Photos of kangaroos pop up in a few of the boxes now at Hopkins's Alan M. Chesney Medical Archives at the Medical Institutions. It was an adventure, after all, and one that was rarely scripted. In May 1943, the Hopkins unit set up an expanded hospital at Herne Bay, 12 miles southwest of Sydney. It was touted as one of the largest Army hospitals outside the United States. The number of patients peaked at 1,700 that winter. As the fighting moved northward in the Pacific, many of the new patients were malarial cases. In mid-1944, secret Army orders were sent to move the 118th General to a combat zone, joining the Sixth Army task force. They traveled first to New Guinea. Then, two days after Christmas 1944, First Lieutenant Dale and the other nurses of the 118th boarded the U.S. hospital ship Emily H.M. Weder, heading for the Philippines. On January 3, the nurses reached the port of Leyte. Nights there were foggy and full of rain. The days were hot. Captain Helen Weber ('34) wrote a letter to the Hopkins Nursing Alumnae Magazine in January 1945, one of several dispatches home about her experiences and the unit's conditions. (Hospital wards at one point would be made of woven bamboo and canvas, with burlap linings tacked on to keep out mosquitos). Heavy rains turned "everything into a sea of gluey mud. "Our enemy is the weather," she wrote that January. "Day after day it rains. Drainage ditches overflow into the tents making the unfloored surfaces muddy; tents leak; clothes, equipment, and bedding acquire a constant dampness. They smell musty, and often (especially leather) mold; spaces between tents and buildings are a series of ponds and swamp. "You have no idea what difficulties arise when you wrestle with mosquito nets and utter darkness. . . dispelled only by a flickering candle or the single ward lamp, while you do compresses, intravenouses, give medications, or take temperatures." The night they arrived, exhausted nurses dropped into bed, only to be awakened twice before 7 a.m. by air raid alerts. The alerts meant standing outside in the dark looking at faraway fires and listening to the sound of shooting above--"the ack-ack overhead," as Weber described it to people back home. Other times, the war felt even closer. Dale remembers some of the nights she ran a 90-bed unit for the critically injured. "The nurses' quarters were in the back end, and some of the Japanese in the mountains were firing over us," she remembers. "I didn't like sleeping there, so I threw a mattress on the floor under one of the patient's beds. You didn't get undressed, you just flopped down and slept where you could. A chief corpsman would wake us up to change an I.V." Work on the islands was often exhausting, Captain Weber wrote in one of her dispatches from the nurses' temporary assignment in New Guinea: "Fresh casualties have been pouring in from the north. For a few days, we worked 6 hours, then 8, and finally, although posted 8, we worked 10 and 12 hours. As I write, 23 of our nurses are on 12-hour night duty. "Nevertheless, we are getting valuable experience. Our people are probing for and removing shrapnel, dressing new, raw stumps, and doing many surgical procedures which until now were done by our [doctors]. One nurse, not infrequently, carries a ward of 40 bed patients. . . . Emergency major operations are done frequently on the wards and the ward nurse scrubs!" As noted on the back of this photo: "These two Sad Sacks leaving the 118th for New Guinea are (l to r) Virginia Varney ('42) and Bertha Mellon." Among other things, the Hopkins nurses would fight for equipment and medical necessities, taking on Army bureaucracy and a worldwide communication system that was sluggish and ineffective. In several letters beginning November 1944, Weber wrote Hopkins nursing school director Wolf about a need for Hampton pads, a type of bedding that was apparently more comfortable and sanitary. "Dear Miss Wolf," Weber's hand-written letter began, "A group of us, including Miss Sanders, were discussing the greatest needs we find in nursing under base conditions, and we came to the opinion that linen was one of the great lacks. Laundry facilities being so limited, bed linen is changed but once a week. With seeping burn cases, with surgical casualties having drainage, you can see how serious this is." Weber asked Wolf if Hopkins or a Baltimore Red Cross Chapter could help. An answer came nearly three months later: Shipping space was too limited. "I cannot tell you how sorry I am that we cannot help you with this request," Wolf wrote back. If help was possible, Wolf likely would have found a way. Back home, she was asked to advise the federal Office of Defense, Health and Welfare Services in a committee on nursing recruitment. She was one of several Hopkins leaders tapped as wartime consultants to the U.S. Government. A Western Union telegram Wolf sent on January 13, 1942, to the federal agency read simply "CAN SERVE COMMITTEE." "An old Hopkins joke has it that during the war a helicopter arrived on a remote island in the Pacific carrying a doctor who was needed urgently for emergency surgery. The doctor was led to a small hut which staff had readied for the operation. "Once scrubbed, he approached the makeshift operating table and surveyed his patient. Ready to begin, he reached for an instrument, but the nurse shook her head and handed him a different implement. 'Oh . . . don't tell me,' he sighed, 'a Hopkins nurse.'" A surgical team of the Hopkins 118th in action in the operating room. Third from left is Hopkins doctor William Grose. On the far left, archives captions show, is nurse Anne Seney. Such stories are told about the 18th General Hospital. Weeks after the initial deployment back in April 1942, that Hopkins unit landed in New Zealand aboard the U.S.S. General James Parker, and soon moved on to the Fiji Islands. There, nurses and doctors spent about two years treating battle casualties, some from Samoa, New Hebrides, and Tongarewa. Amelia Jane Pierson ('32) served as chief nurse. Again, the unit was a makeshift, yet resourceful, operation: the hospital on Fiji, Hopkins nurses wrote home, was constructed over the patients--roofs put on prefabricated buildings with patients in their beds underneath. Some of the blankets came out of a box labeled "Packed November 1917" addressed to "The Johns Hopkins Base Hospital Number 18, St. Nazaire, France." Tin cans, filled with cement, were used as weights for traction and the anesthetist's breathing bag was the inside of a football. Virginia Brown Lester ('41), who now lives in Baltimore, spent 10 years after the war working in the pristine operating room at Johns Hopkins Hospital. Just past her 80th birthday, she remembers the wartime scene at Fiji. "We sometimes worked in mud over our boots," she says. "We worked long, hard shifts. During the difficult, busiest times, we had a tent city for the patients." Lester, whose married name is Melvin, remembers Fiji as a beautiful place--the hospital, centered at the Queen Victoria School for Boys, sat on 250 acres of land. "We were on a hill that looked out over the water. At times we'd go to the beach and have a good time," she remembers, noting that regular rounds of casualties blocked out all else. "Other times we didn't even think of it." A recreation club called "The Oasis" offered ping pong, checkers, and dancing. Melvin says some nurses in the units dated officers, though usually not doctors. "The doctors were our friends and most of them were married," she says. "When we dated, we dated outside our unit." Because the nurses were officers, they weren't allowed to date enlisted men. A few nurses married wounded soldiers they had treated. 118th Chief Nurse Mary Sanders (l) poses with visiting Lt. Col. Clemens in 1943. During quieter moments, she remembers, the nurses also appraised their position in a rapidly changing American military. "When we went over, we were in the service as second lieutenants," Melvin remembers. "A regular [male] second lieutenant was paid $125 a month, and a buck private was paid $30 a month. We had second lieutenant bars, but we were paid only $70. We resented that very much. "'Either you are a lieutenant or you're not,' That was our argument. We had the gold bars," she says. Rank had been an issue for women in the military since before the 1898 Spanish-American War, when the Army hired nurses as contract workers to treat Americans wounded in Cuba, Puerto Rico, and elsewhere. Until the mid-1800s, in fact, nursing was considered domestic work--a situation altered greatly by English nurse Florence Nightingale's courage in the Crimean War and later crusades to professionalize nursing. As schools of nursing became more prevalent, nurses' professional groups lobbied for officer's rank. A 1919 pamphlet printed by the National Organization for Public Health Nursing cited a lack of respect for nurses without officer status. In emergency situations, military hospital staff, including orderlies, frequently disregarded nurses' orders and questioned their knowledge and authority. In World War I, nurses would be assigned "relative rank," which gave a level of status, but didn't offer equal pay or veterans' benefits. It wasn't until the middle of World War II, after nurses started complaining and recruitment became more difficult, that equal pay and benefits became common. One Hopkins nurse, Lillie C. Hotz ('39), who was stationed stateside in Fort Leonard Wood, Missouri, wrote the nurses' alumnae association, asking for "hearty active support to the bill in the Senate . . . to provide full military rank for members of the Army Nurse Corps, dietitians, and physical therapy aides." Women's roles were changing faster than officially recognized. Second Lieutenant Helen Dolan Flately, of the 118th, opened a school of anesthesia in the hospital at Herne Bay. Weber, chief night nurse, held astronomy classes for doctors and nurses. Anne Seney ('37), a second lieutenant in charge of operating rooms, co-designed a new surgical building. Her successor, then-First Lieutenant Virginia Thompson ('40), led efforts to pack up the operating room for transfer to Leyte. Some of the shifts in tradition struck a personal note. At first, Second Lieutenant Lester just couldn't quite get used to the idea of wearing pants. Nurses of the 18th General didn't have uniform skirts when they arrived in Fiji, she remembers. So they bought men's pants and hired Fijian tailors: "Three pairs of pants would make two skirts," she says. Cadet Nurse Corps celebrates its first anniversary in July 1944 with a cake cutting. Irene Martin ('44) is on the right, knife in hand. In mid-1944, the 18th General Hospital packed up and headed for Assam, India, to treat soldiers wounded in the Burma-India theater. The nurses landed in Bombay, a city jammed with rickshaws, bullock carts, and humanity. They took a troop train to meet the Hopkins doctors and officers who had gone ahead to set up a new hospital unit in the jungle. The officers welcomed them by lighting lanterns in each tent, making up cots, and drawing mosquito nets closed. Soon afterward, Lester went to her first dance in Assam. "I looked in the hall and saw all those women in pants and said, 'I'm not going in there,' Melvin (then Lester) remembers. "It took a little getting used to the idea of feeling dressed up in pants. In India, after 5 p.m., we all wore pants stuck into boots and our collars buttoned up because there was a lot of malaria." That Hopkins unit had already become a center of malaria study for the U.S. Army, led by Colonel Benjamin M. Baker ('27), who went on to become the chief malaria control officer for the Pacific theater, according to Turner. As the war continued northward, fewer casualties were sent to the 18th General. Professional boredom and stagnation set in, causing frustration among Hopkins staff. By early 1945, nurses and doctors were being rotated home--mostly one by one. By August, the 118th General Hospital, too, was disbanding. "We had looked forward to the time when our nurses could get home," Nunn, of the 118th, wrote the Hopkins Nurses Alumnae Magazine: "Perhaps the seven of us [left] who numbly watched our friends climb into trucks and wave good-bye seemed brave about the exodus. We were not." 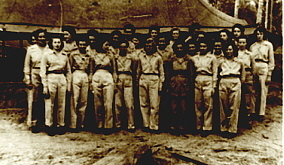 During the war, dozens of other Hopkins nurses enlisted in the Army and Navy, serving with units in England, the Marianas Islands, Greece, Egypt, Yugoslav refugee camps, and other locales. No one has kept track of those numbers. But, including Hopkins nurses, a total of 72,000 military nurses served in World War II. "Chances of Snaring Man Used as Nurse Corps Bait"
"The high marriage rate among trained nurses is being used as an enlistment talking point for the new U.S. Cadet Nurse Corps." "We always put that in the second paragraph of our recruiting literature," said Miss Lucile Petry, corps commanding officer. Miss Petry herself is single, though youthful and easy to look at in the cadet corps uniform--slate gray with silver buttons and scarlet chevrons and soldier straps. While Hopkins nurses served abroad, a contingent of nursing students back home joined the war effort. Also honored by the Women In Military Service For America Memorial, these nurses stepped into wartime hospitals and classrooms in an era when-- despite the dated propaganda pitches--women were increasingly treated as professionals. Petry ('27), who did get married and took the name Leone, is a Hopkins graduate who helped build and lead the Cadet Nurse Corps. Created by the U.S. Public Health Service, the corps would be touted as the most successful of all wartime recruiting programs, graduating 124,000 nurses before ending in 1948. Created in 1943, the corps was a scholarship program meant to alleviate the shortage of professionally trained nurses at hospitals stateside. Because the corps agreed to pay annual tuition ranging from $50 to $800 (and an average $25-a-month stipend), women who would have never considered nursing joined up. After graduation, they promised to work for the military, in local hospitals, on Indian reservations, and elsewhere. The cadet corps, originally named the Victory Nurse Corps, wasn't officially military, though it was based on a military model. And it helped change the field of nursing forever. "I've talked to many, many nurses who said they couldn't have afforded nursing school otherwise," says John Parascandola, historian with the U.S. Public Health Service. "A lot of hospitals were short of nursing staff and had to really depend on the student nurses." The recruitment effort took on the tenor of a media blitz: Calls for nurse cadets graced ads for Pond's Cold Cream, PepsiCola, and Sanka coffee; radio dramas, movies, and the Parent Teachers Association (PTA) were all fair game for a pitch to join a career filled with "romance, excitement, adventure." The Cadet Corps uniform became central to the campaign, a visual tribute to patriotism. In a quintessential P.R. move, the government held a New York fashion show asking magazine editors to choose the style. Petry Leone modeled the uniform for more than a few photo shoots. Now 97 years old, she is not available for interviews. After leading the Cadet Nurse Corps, she was named an assistant surgeon general in the Public Health Service in 1948, the first woman to hold that position. She later fought to develop a research movement in nursing, setting up grants and teaching scholarships. As she once pointed out: "without the tumult of World War II, we might have waited more decades to open our ideas to the bigness of nursing." True to history, Kay Turner, 74, models her Cadet Nurse Corps pin and nurse's cape. Among other things, the Cadet Nurse Corps helped upgrade nursing schools across the country. To qualify for the program, schools needed to expand libraries, course offerings, and housing, and add high-quality faculty. The corps stepped in with federal funds, and in essence created a template for apprentice-style training. And, like the now-famous "Rosie the Riveter" female industry worker, wartime nurses in the States took on jobs traditionally off-limits to women. In hospitals, in part, that meant being instructors in the fields of disease treatment, pharmacology, chemistry, and other sciences. During her first years at Hopkins, the war consumed nearly everyone's daily life. Hospital administrators drew up emergency plans to prevent enemy sabotage. Baltimoreans heard rumors of war vessels lurking off the Atlantic coast and the Chesapeake Bay. Food supplies for the hospital were rationed, and non-military research projects suspended. The staff faced electricity shortages, and many paid federal war-fund payroll deductions called "victory taxes." For Clemson, whose married name is Turner (no known relation to the historian), the nurses at Hopkins Hospital had all they needed: "There wasn't the extravagance there is now. We boiled syringes and reused sterilized rubber gloves. There wasn't the spread of infection either." She remembers that nursing students took on more responsibility over the months. "In our last years [of study] we became charge nurses, in charge of the whole ward," Turner, now 74, says. "I saved a doctor's reputation once. He had ordered medicine in an adult prescription for a child. That was our job, to see that prescriptions were right." Turner's cadet nurse uniform is in a box somewhere in her house in Southern Maryland, where she has since retired after working as a nurse at a private school. But she can pull out her J.H.H. blue nurses' cape, and the Cadet Nurse Corps pin she has since stuck to a floppy, dark blue hat. She wore that hat and cape to the opening ceremony of the Women In Military Service For America Memorial on October 18, 1997. More than 36,000 people crowded Memorial Drive at Arlington National Cemetery that day; some pushed veterans in wheelchairs along the smooth asphalt. Now, sitting in her home along St. Inigoes Creek, she thinks back to the war years, with some regret. Romance and adventure are still reflected in her eyes. "I think it was so exciting," she says. "But for the cadet nurses it was also a big letdown. Here we were all geared up to see the world, all gung ho. Then they told us thanks, but no thanks. The war was over, and they were sending nurses home."